We were on our way to Isola when we came across this new restaurant. I believe it opened a couple months ago and the exterior looked very promising so we decided to give it a go. The design exudes a kind of updated rustic charm if that makes sense, with clean lines and wooden furniture. The menu also looked delicious - particularly their Betty's Burger, chargrilled chicken, and duck confit, all served with duck fat fries. When I ordered, I was envisioning the dish to be more...green. I thought I would be eating seared tuna on a bed of mixed greens with tomato and basil. For the price you're paying, this is definitely not worth it. Really, how can you call that a salad?! While taste-wise it was passable, I was really disappointed. They should have a picture menu! Or the waitstaff should warn you that this can't possible constitute lunch. Pretty disappointing as well. The outside of burrata is mozzarella but inside contains both mozzarella and cream. Thus when you cut into it, the creamy goodness should ooze out. Unfortunately, as you can see above, there was no oozing :( Quite like my poached egg from FINDS. I tried a bit and it tasted just like regular mozzarella - I couldn't detect any buttery texture or the sweetness of cream. Sigh. Better stick to Classifieds! 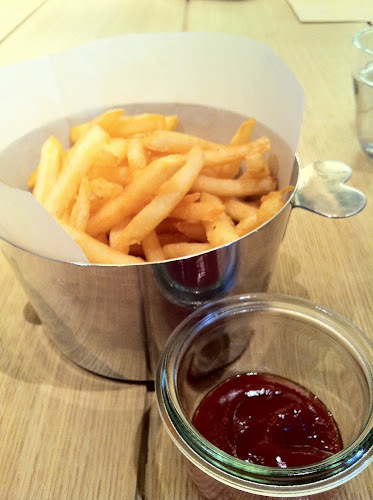 We also decided to share a serve of the duck fat fries which sounds amazing but was not. So again we were deceived by the menu. We were picturing thicker cut fries with crispy exterior and a soft centre, and of course a nice ducky essence. 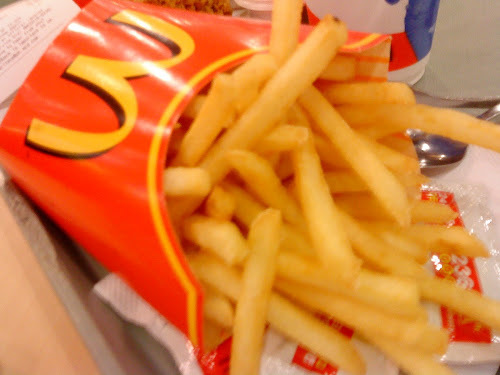 But honestly, it tasted just like fries from McDs. They were even cut the same too! And no homemade ketchup = fail. What's the point of frying in duck fat if your duck fat has no taste. Waitstaff were very friendly and cheerful (despite having to endure wearing ridiculous costumes) but food was hugely disappointing. I also hate that their tagline is "serving modern eclectic food with a new retro experience". Uh. What does that even mean?! Conclusion: stick to Tasty's Congee!